SAMARA, Russia (AP) Midfielder Abel Aguilar won’t play for Colombia on Thursday against Senegal because of a left adductor injury. Colombia coach Jose Pekerman said Aguilar wouldn’t be available in the team’s decisive final group match in Samara, but he did not rule the 33-year-old veteran out of the rest of the tournament should Colombia advance. Aguilar underwent an MRI to determine the extent of the injury. 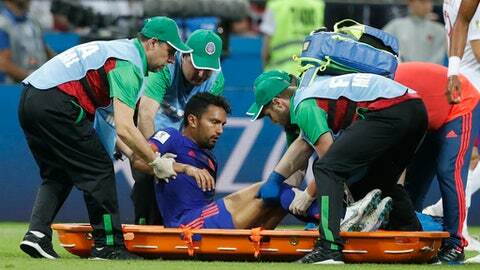 Pekerman said Wednesday the injury wasn’t as serious as feared but it would still keep him out of the group finale. ”We just need to give it a few days and see if he’ll be ready then,” Pekerman said. Aguilar was replaced against Poland by Mateus Uribe. But Pekerman, who praised Uribe’s play, would not say if he would start against Senegal. ”Uribe came on in a complicated match and he lived up to our expectations,” said Peckerman, who called Uribe the team’s 12th man.